Netru Indru Naalai: Yesterday, today and tomorrow -- that was the theme of the unique musical created by Mani Ratnam and his team of technicians -- Vasanth, Rajeev Menon and Sabu Cyril -- in aid of The Banyan, a home for the mentally challenged. Banyan was started by Vandana and Vaishnavi when they were still in college, in 1993. Over the past 12 years, it has reached out to more than 1500 women and reunited around 850 with their families across India. 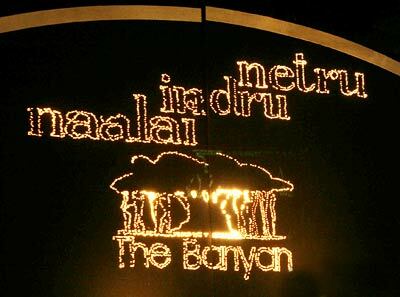 The Naalai (tomorrow) for The Banyan is "to ensure that no mentally ill homeless person is left uncared and unattended for in the streets, and they live with dignity and hope." For Mani Ratnam and co, and the thousands who assembled at the Jeppiar Engineering College Ground, it was a magical journey through the past, present and future of Tamil cinema.